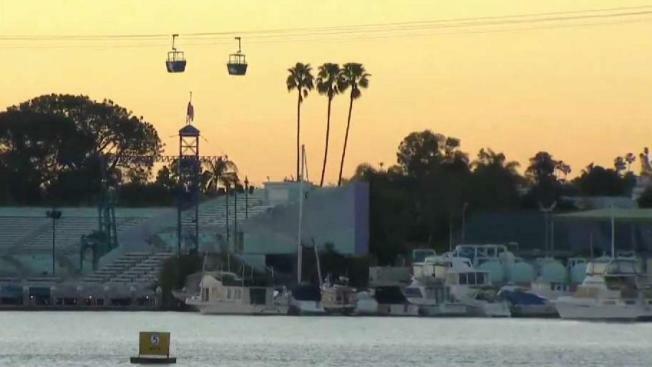 More than a dozen guests were stuck on a gondola lift ride at SeaWorld San Diego for nearly five hours before rescue crews were able to lower all of them to safety Monday night. Sixteen people were stranded in five gondolas on the Bayside Skyride when a big gust of wind tripped a circuit breaker that stunted the ride, San Diego Fire-Rescue Department Battalion Chief Robert Logan said. Among the guests trapped in the open-air gondolas over Mission Bay was an infant and a person described as partially paralyzed. Rescue crews were called in at around 7:20 p.m. and it took two hours before the first two guests had reached the ground. Crews used a rope system to lower guests one-by-one into boats on Mission Bay, Logan said. "Something like this, we want to be slow and methodical," Logan said. "A fall from that distance can be catastrophic." A special harness was needed to lower the infant down, according to Logan. By 10 p.m., half of the guests had been rescued. And just before 11 p.m., all of the guests had been rescued and taken to a nearby dock. Jonathan Sherr was in a gondola with his 15-year-old son when, at around 6:15 p.m., the wind "just started rocking the cart." "I looked up at the cable, and right when I was looking up at the cable shaking violently, we just stopped," he recalled. There were some wind gusts prior to getting on the ride, he said. Kimberly Alize Sanchez, 12, was trapped in a second gondola and also noticed windy conditions before her and her young cousin got on the ride. "I don’t know even why SeaWorld had the thing open," Sanchez said. "They should’ve just told us to walk out because it was windy, we could’ve fallen off, something could’ve happened. And something did!" Sanchez said she and her cousin crouched down on the seats and did not move for hours for fear of moving the gondola. The gondola was "rocking back and forth for at least two hours," she said. "Just rocking back and forth. We just tried to sit as still as possible, not trying to move." After the frightening ordeal, both Sherr and Sanchez said they would not be coming back to SeaWorld. "Watching the cable shake violently was a pretty daunting thing," Sherr said. He was inside gondola number four, but when it stopped moving, he said he and his son were "at peace." His daughter, Dylan, had just gotten off the ride when Bayside Skyride lost power. "We would have been stuck up there if we didn’t go before them," she said. "We were the last ones to get off up there." Sherr claimed there was a lack of communication between guests and SeaWorld for the first hour they were trapped. However, the theme park said it is in accordance with the "highest safety standards." SeaWorld said it was in contact with all of the trapped guests during the rescue. Blankets were already available on the gondolas, the theme park said. Warming packs and additional blankets were brought up to the stranded people during the rescue efforts, Logan said. Natasha Nelson told NBC 7 her family members were some of the other guests trapped on the ride. Nelson said her 11-year-old daughter and 12-year-old nephew were in one gondola. Nelson’s sister, Naomi Ince, and Ince’s 9-year-old daughter were in another gondola. No injuries were reported and all guests were reported to be safe once returned to land. SeaWorld said it will conduct a thorough investigation of the ride before it is back in use. Guest safety is paramount. Due to an unusual gust of significant wind, the operations of the Bayside Skyride stopped. A number of guests are currently on the Skyride seated in 5 gondolas. We are currently working with San Diego Fire & Rescue and the San Diego Lifeguards to evacuate the guests from the ride. We practice emergency evacuation procedures with local first responders annually. We are in contact with the guests via intercom, and they have been made aware of the evacuation procedures. There are also blankets on board each gondola. Evacuations will be conducted in accordance with the highest safety standards. All the guests are currently safe while awaiting evacuation. Guest safety is our top priority. Once our guests are cared for, we will conduct a thorough inspection of the ride prior to re-opening. We apologize for the inconvenience this has caused the guests.